Click here to see a non-scaled image. * DOORS (Sliding) Stainless steel top and door pan with integral handle. Includes door locks. * ELECTRICAL 115V, 60 Hz., 1 Phase. Furnished with 6 foot rubber plug-in cord (115V model only). * PLUMBING No drain required. Condensate evaporates automatically. * INSULATION 2 inch foamed-in-place polyurethane insulation. 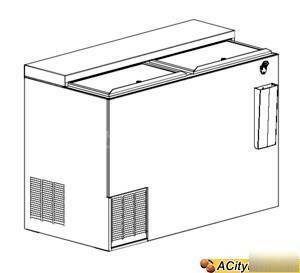 * REFRIGERATION R134a capillary tube/type with hermetic condensing unit. Pulls out for service and cleaning. Defrost system automatically defrosts every six hours. Adjustable temperature control holds product at approximately 30Â° F.
Perlick Blk Flat Top Drink Bottle Cooler S/S Int.